The Barclaya genus contains only three species, all native to South-East Asia. Although the relationship is not immediately apparent, the barclayas are closely related to water lilies and are included in the same family. 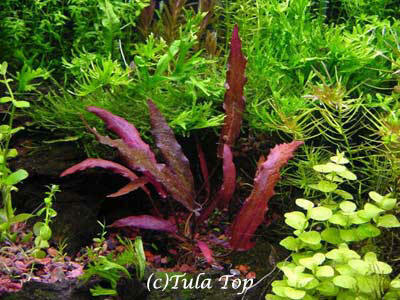 The only species found in the aquarium trade, Barclaya longifolia, demands strong lighting - otherwise its leaves will remain small - and a neutral or slightly acid, barely mineralized water. Growth can slow down during the wintering period, but new leaves appear afterwards. It is difficult to make it reproduce by cutting the rhizome, and so it is best to wait for young leaves to sprout. This plant needs to be kept on its own to highlight its distinctive coloring. Size: 40 cm. ВЛАДИСЛАВ II (Vladislav II) Ягеллон (1456-1516) , король Чехии (с 1471), Венгрии (с 1490). Сын Казимира IV. Закрепил (1500) привилегии чешского дворянства за счет прав городов.